NAIROBI (Reuters) - On a trip to East Africa last week, a beaming French President Emmanuel Macron was driven through the grounds of the Kenyan president's official residence in a locally assembled Peugeot 3008 car. Macron, 41, is trying to recast the style of France's engagement in Africa, where it was once a colonial power, hoping that building warmer cultural and personal ties will help boost business, trade and investment. But Macron's four-day tour of Kenya, Ethiopia and former colony Djibouti showed how big a battle France faces in Africa, where China, Turkey and others have moved in quickly and aggressively, and competition is fierce from African countries. In 2017, French exports to Kenya, a former British colony, were about $200 million -- about half Uganda's exports to its neighbour. China exported $3.8 billion, making it Kenya's biggest trading partner. "We've always used that form of diplomacy to implant ourselves," said a French diplomat in the region. "But it becomes all the more important when facing China, because it differentiates us from their contract-oriented, low-cost, low-interest model of doing business." Trade figures across the continent show how tough the task ahead is for France, the world's sixth largest economy. Last week's trip was a chance for Macron to show that "for too long we treated these East African countries like Banana Republics and they don't like that," said a former French envoy. "They have resources, financial means and growth. "I'm not convinced that what is seen as 'our Africa' (France's former colonies) can offer the business opportunities we have elsewhere on the continent." "It's not easy to develop these economic links," said Francois Gualme of the French Institute of International Relations, who worked for France's development agency. "There's a political presence, but the economic presence remains small." There are many signs of China's presence, including Chinese labourers building skyscrapers or greetings of "Ni Hao" from children. Some Ethiopians resent the Chinese influence and hark back to when French and European influence was felt more widely. Near the old French railway terminus in Addis Ababa, a group of former rail employees sat chatting in French at the Railway Workers' Club in between games of petanque. "You are from Paris, this is all from Paris," said one who gave his name only as Getachew. "France must come back." That sentiment was expressed elsewhere in Ethiopia, where France has said it will share its expertise to develop tourism and rebuild the landlocked country's navy. "China is bad for us," said Wonde, a 30-year-old taxi driver. "They bring China here -- workers, food, women -- and leave nothing for the Ethiopians." "There's the political will from the prime minister, but the administration doesn't necessarily agree with everything that's being done," said one French executive. "It will take time to clear the bureaucratic hurdles." Automaker Peugeot assembles two models in the country and a range of French companies -- from Vinci to water and waste utility Veolia, energy firm Total and electricity group EDF -- are vying for opportunities in the East African country. 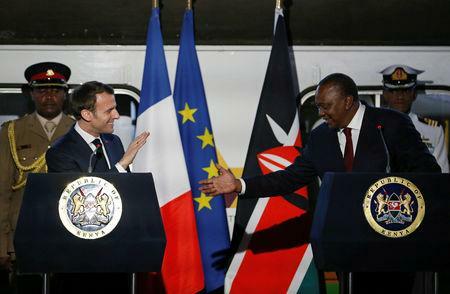 But French businesses account for just 1.4 percent of the total market share in Kenya, and France ranks only 17th among trading partners in the region's most dynamic economy. 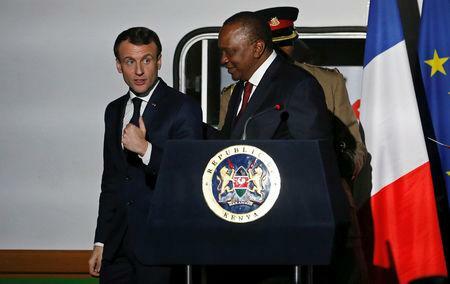 "The relationship is not so much unbalanced between our two countries," Macron said alongside Kenyan President Uhuru Kenyatta. "It is worse -- it is weak to poor. There was, at least, success during the trip for a smaller business. Christophe Passelande, chief executive of Malteries Soufflet, said his barley malting company broke ground on a vast new plant on the outskirts of Nairobi he hopes will tap into Kenya's large and growing beer market. "When it comes to malting, the important actors are not Chinese," Passelande told Reuters. "Our industry has real French know-how, and because of that we're here first." Asked whether France was a preferable partner to China, an Ethiopian businessman accustomed to working with the Chinese said: "Why would we want to put all our eggs in one basket?"